Im getting ready to fab up the rear deck/trunk of the speedster project. I pretty much have everything figured out, except how to make a nice "corner" on the edge of the trunk. I plan on a top piece with a hole for a small, simple, flat plate, trunk lid. Then there will be the two side pieces. All the sheet metal fits over a wood "skeleton" framework. 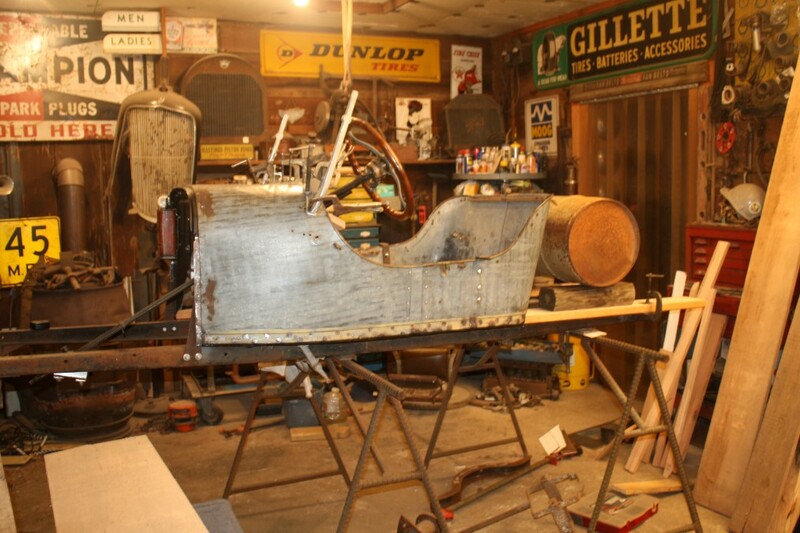 I plan on the two side pieces being folded under the frame work at the bottom and the front where it meets the back of the body bucket. My question is how to make the top corner/edge joint. with basic sheetmetal tools. I have a 4 foot brake, a 4 foot slip roll, a crimper that makes crimps like the end of a stove pipe. A three foot seamer that makes the same joint as the side of a stove pipe, a bead roller that will reach the center of a 36 inch panel, and a lot of Pexto tools I do not know how to use yet that does wire edges ect. I can make up "bucks to hand form some of the curves or small flanges, but do not really have a good idea of how to join the corner/edge ... Ill post a pic of a body very similar to mine, with the joint in question marked. My rear deck is almost identical to the one in the photo. Ill have a round 20 gallon tank like shown in the photo. Im also still trying to figure out a good seal around the tank where it sits in the deck/trunk. any ideas are appreciated.. I can imagine using a "Pittsburgh joint" it might be a little on the crude side. if you want a smooth radius blend, without the metalworking skills to make it from a sheet, then bend a piece of thin wall tubing and weld the top and side sheets to that. Mat, explain what is a "Pittsburg Joint" ?? I forgot to mention that my body is made of galvanized metal. 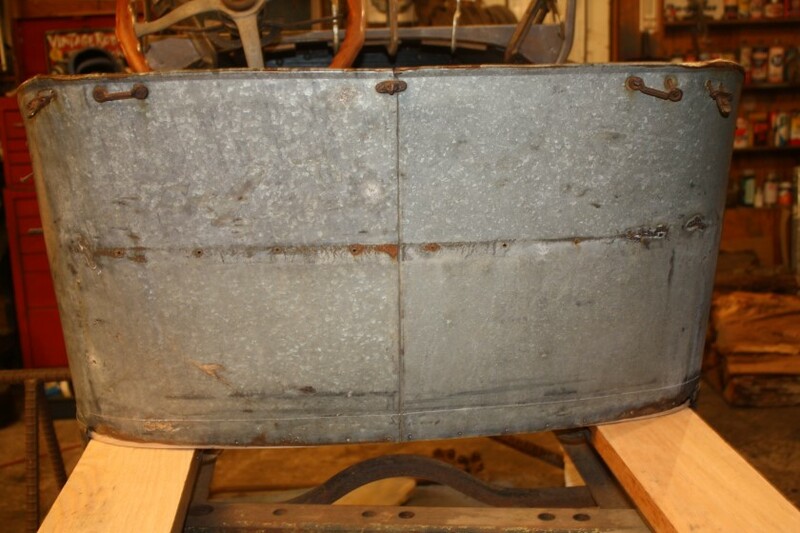 It is described in a lot of period sales literature as the bodies being made of "anti-rust metal". So welding is not going to be much of an option. I am also trying to match the "patina" of my original body. I have acquired some "aged" sheets of galvanized metal that is almost a perfect match to my original body metal. It was the roof panels of "wards" school buses. It has a genuine "age" to it and then was walked on, used for stacking things on, and generally abused. so it matches my body that looks like a "sack of walnuts" . I use 3/4" particle board covered with 1/4" tempered hardboard. (Glued to both sides of the PB) It will handle up to at least 18 gauge steel. I've been using it for some pretty tight radii on wired edges and flanges. I put a radius on the edge of the tempered hardboard with a router. You'll need fairly hard wood. I wouldn't use plywood or chipboard. Work along the entire edge bending a little at a time even if you have to move your clamps. Don't try to bend the flange all at once or for a short length or you'll stretch the metal at the end points of your hammer area. You can spot weld galvanized steel, if you have a spot welder. Otherwise, solder the joint. To make the joint solid and easier to blend, I'd use an overlap joint with an off-set (stepped flange) the same thickness as your metal. Then just solder-fill and smooth. "The flange on the inside radius of your tank are will need a little stretching." "The flange on the inside radius of your tank area will need a little stretching. 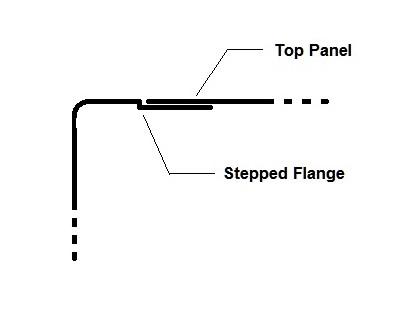 Here's an image of a stepped flange. Chad,I had heard the term "Pittsburg Joint" before, but was unsure what it was. Thanks... Ken, I have used hammer forms like you describe before. That is how I envisioned making the side panels "roll" over the top edge and into the tank opening. I figure I can "hammer/roll over about 3/4 inches with little problem. But attaching the top panel to it still eludes me. I have a flanger to make the "stepped joint you show in the diagram. It will work with the radius of the deck corners OK. I used it to make a rail around the bottom of the body/bucket to attach a trim piece to. My body had the remains of a trim strip around the bottom of it. 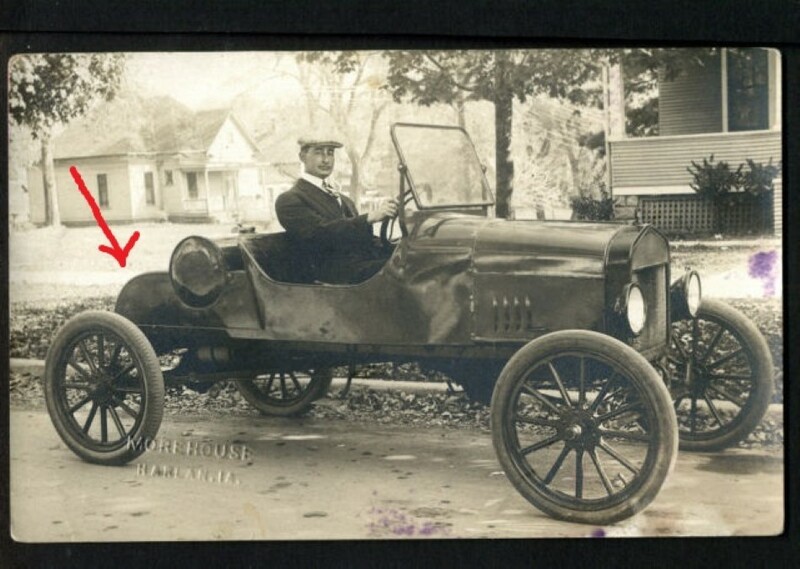 It was either a later repair to cover rust or it came that way, Im unsure. I put it back the way it was, as it covers about 40 nail holes down each side. Ill post a couple photos of my body and you can see the rail I made using the stepped flanger. I will then make a cover/trim piece to snap down over the rail and fold under the bottom of the body. You can also see the original "Pittsburg Joint" seam in the rear of the body bucket. I would love to have a "Pittsburg Joint" seam down both sides of the rear deck in the top of the deck panel, about one inch in from the outside. But I have not figured out how to do it. My "Pittsburg" machine will only do straight pieces. I just thought about a double folded over joint and maybe solder it, but not sure if I can get the dirty galvanize clean enough to tin it. Ill post a diagram of my thoughts, please ignore the poor art work not drawn to scale. I also found another ad showing a deck almost exactly like Im trying to build.. Sorry the diagram is not rotated right. I had rotated it to be correct, but somehow it rotated back .??? What thickness or metal gauge are you using? It's going to be tough putting a lock seam in before the flange since the flange will need to shrink on an outside radius (the rear) and stretch for an inside radius (the tank cutout). The lock seam leg will have to do just the opposite when it rolls back over the flange. You will have to put the lock seam in after the flange and work it as another flange. 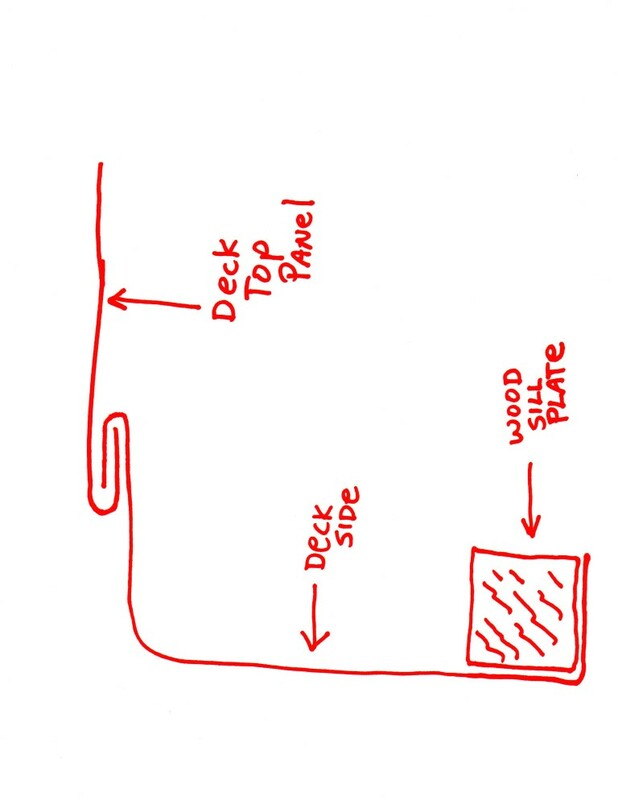 The lock seam doesn't need to be pretty but it should be straight/flat since the deck panel will cover it. The lower flange shouldn't be a problem. Ken. If I was to do a lock seam, My thinking is to hammer form the sides of the deck to give me as close to a 1 inch flange into the gas tank opening and the top edge of the back curve. Then I would have to "hand form" the bottom half of the lock seam, and fold it back, so that the top 1/2 of the decks lock seam will fit into it. Then I could fit them together and hammer them flat. With a little "hammer and dolly" work, I think I can get it to look OK. Then I would try and solder the lock seam shut. I would have to "tin" the lock seam area before starting to make them. 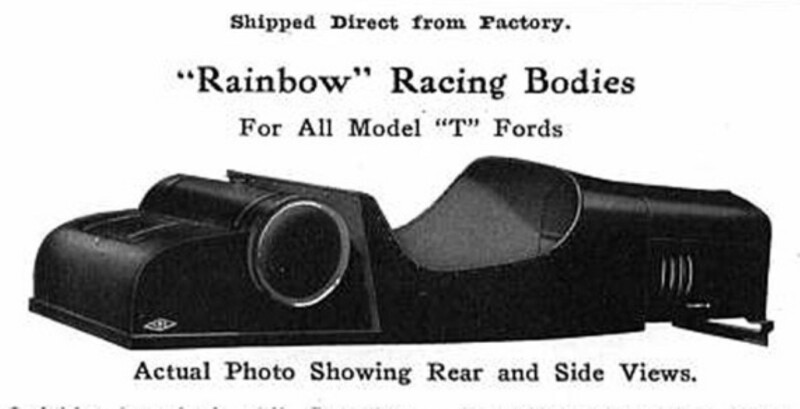 I have also looked at the "Restoration Supply Co" catalog. They have 1/2 oval in brass. aluminum, and steel. The cost is not that bad. I could do a hammer form edge and then a basic overlap. Then use the 1/2 oval trim to cover the seam. They sell it in 1/2, 3/4, or 1 inch sizes. Instead of solder I could also use panel adhesive that they use to glue the new cars together with. If I was to use the 1/2 oval trim I could also spot weld the seams together under the trim. The 1/2 oval trim is probably the easy way out... Ill have to check tomorrow and see what gauge the sheet metal is. Its not real heavy, so it should hammer form well. If I was doing a standard build that would be painted, It would be so much easier than trying to use old material and save the "look" and "patina"
Here is a chart of different seams I found on the web. 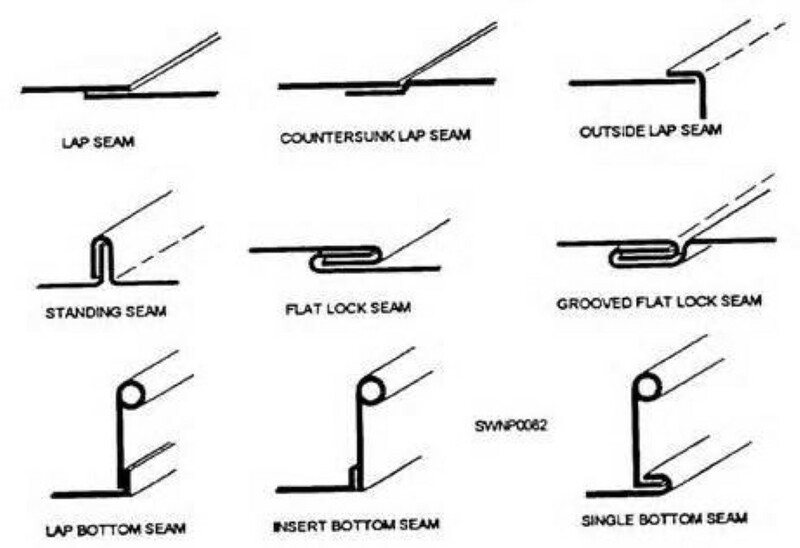 I will probably use the "flat lock seam" or the "countersunk lock seam"
If you want the seam to look like it's trimmed with a molding, use the "Grooved Flat Lock Seam" but flip it. This is also a self-locking seam. Solder the open end for weather proofing. See image below. Do you have a bead roller and tipping dies? It would make life easier for starting the seams. 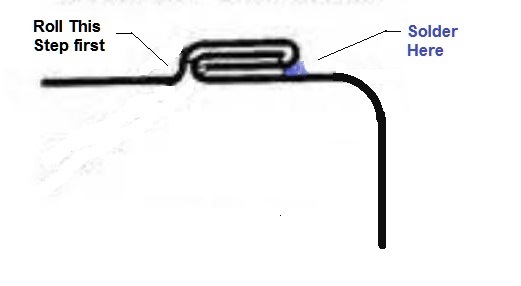 The seam could be rolled flat (and locked) with an English Wheel. But careful hammering will work too. I'm sorry. I am not yet able to post pictures or art, after looking at your concept and trying to preserve patina. I do believe the pittsburgh seam will serve well. the joint actually forms the corner. The seam is used to make curved ductwork. Google images can help. the side panels would be have a small flange applied, Ken describes how this is done. The deck would have the seam applied, then folded over the outside to lock it all in. I had a heating contractor run my sheet through their powered machine. Just a thought but if you had the 2 sides of a 24-25 Coupe the rear deck section has almost identical curves and the look of the speedster pics you have posted. Since your having to make the back section anyway the 2 sides could be modified to fit and look pretty well. Just an opinion but you would have the 2 well formed back curves to start with. Some thoughts about using the Pittsburgh type seams for curves in duct work and etc. We made duct work using sheet metal brakes, benders, Pittsburgh machines, rollers and etc at the school I worked for and I really had good luck using wooden mallets to form the curves. Wood doesn't scar up or dent the metal like the metal hammers will but I guess its to each his own. We started using the wood mallets because there would be exposed duct work in some of the buildings we installed the duct work in. The duct was insulated on the inside and the exposed duct had to look pretty nice in the hallways. You can use the hardened rubber or nylon faced hammers also. I imagine there are a few sheet metal mechanics on the forum that some better ideas also. I really like the looks of your speedster body. Is that going to be a low hood body? It looks fast just sitting still. Who mentioned a metal hammer? I have about 45-50 objects that may be classified as a hammer (A head with a handle). Besides the usual body work hammers, reground ballpeen and regular ballpeen for BFH work, the rest are all wood, HDPE, leather, rubber or a combination thereof. I made most of them. And I still run across the need to occasionally carve a piece of hardwood or HDPE for a special use or form. There's nothing that irritates me more than someone bringing in a panel (or vehicle) after they've beat the crap out of it with a caveman implement trying to "fix" it.